West Liberty-Salem graduate Logan Cole, right, is a freshman this year at Cedarville University. Pictured with him is his sister Leah, a fellow Cedarville student, as the duo prepares for this school year. 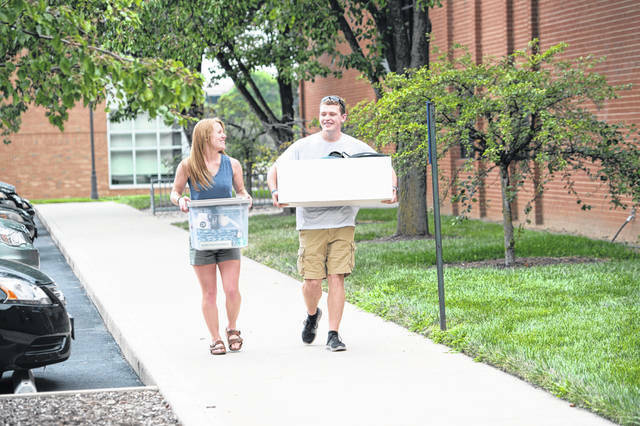 CEDARVILLE — The beginning of a new school year at Cedarville University is a benchmark event for teens moving toward adulthood. The path they traveled to Cedarville was unique for each student, but it’s doubtful any can match the life-changing, and almost life-ending, journey of freshman Logan Cole. On January 20, 2017, Cole was the victim of a school shooting at West Liberty-Salem High School. Suffering a shotgun blast to his chest and his back, Cole had the presence of mind to convince the shooter, classmate Ely Serna, to not carry out what could have been a horrific Columbine-style tragedy at their high school. Cole arrived at Cedarville on Getting Started Weekend carrying more than bags and boxes. Hundreds of shotgun pellets still are in his back and chest. The lead level in his blood sits at around 29, seven times the normal range, because the pellets are leaking. On May 2 this year, Serna was sentenced to 23 years in prison for attempted murder, felonious assault and inducing panic. In addition to shooting Cole twice, he shot through classroom doors, blowing out windows, and fired on a teacher, who was uninjured. One other student was struck by a shotgun pellet. “What I said in the bathroom connects to how I was raised,” Logan Cole told Cedarville University public relations. “I’ve gone to church all my life, and my parents taught me how to handle situations with love and kindness. Principal Greg Johnson and Assistant Principal and Dean of Students Andy McGill walked into the bathroom shortly after Logan made his plea, and Serna handed his shotgun to them. “The scary thing is that most of the time when people have lead exposure, they remove the exposure, but with Logan they can’t do anything,” noted his mother, Julie Cole, a 2001 Cedarville University alumna. Kidney problems, high blood pressure, potential neurological and reproductive problems are the risks. “They would rather deal with those issues that he may have at some point than try to get the pellets out,” Julie Cole said. For all that his family and he have been through, the typical “beginning-of-college” concerns have dominated their hearts and minds as Logan prepared for Getting Started Weekend. “I’ve considered history and computer science,” Logan said, reviewing his options for majors. “I’ve thought about information technology management the last few days. I want to do something I’m interested in that will also help with the family business.” Logan’s dad, Ryan, who also attended Cedarville, is co-owner and vice president of ColePak Inc. in Urbana, which manufactures corrugated and plastic packing partitions for business shipping needs. Sister Leah, a mechanical engineering student at Cedarville, is excited to have her little brother on campus. And now, brother and sister can grab lunch together. Cool, right? “Yeah!” responded Leah. “I guess so,” offered Logan. He’s still a freshman guy, after all. “We’ve been very impressed with Cedarville,” noted Ryan. “I couldn’t be happier that Logan has chosen Cedarville. I’m excited to see how he grows and develops in that environment. Cedarville University, located between Dayton and Columbus, is an accredited, Christ-centered, Baptist institution with an enrollment of 3,963 undergraduate, graduate, and online students in more than 150 areas of study. https://www.urbanacitizen.com/wp-content/uploads/sites/36/2018/09/web1_Coles.jpgWest Liberty-Salem graduate Logan Cole, right, is a freshman this year at Cedarville University. Pictured with him is his sister Leah, a fellow Cedarville student, as the duo prepares for this school year.